Moonlighting is a film written and directed by Jerzy Skolimowski in 1982. It is set in the early 1980s at the time of the Solidarity protests in Poland. 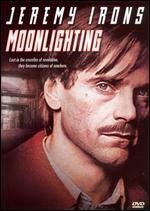 It stars Jeremy Irons as "Nowak", a Polish builder leading a team working illegally in London.